With The Secret World selling less than quarter of a million copies and The Old Republic going free-to-play within less than a year of launch, you’d be forgiven for thinking that MMO titles aren’t keeping an iron-clad grip on the throat of gamers as much as they used to. Even World of Warcraft is hemorrhaging followers, and if most titles in the genre purport to be the next WoW killer, then where does that leave us? Both E3 and Gamescom caused us to be overwhelmed by a veritable smorgasbord of requests to check out free-to-play MMOs to the point that, had I actually followed through on my repeated threats to make a drinking game out of it, I’d be long dead from alcohol poisoning. That’s not to downplay massively multiplayer’s new movement, it’s just that few of them seemed to be doing anything to deviate from the standard formula. Then I saw just a fraction of what CJ Games Global have to offer, and I realised that the reason I was so excited when I left the meeting was because they’re doing something other companies aren’t doing – daring to innovate. Considering how I ended that previous paragraph, I might be putting myself on the back foot when I tell you that District 187 is an MMOFPS that takes place in a world torn by revolution and pits gangs against any remaining law enforcement. However, is isn’t your standard shooter, and there’s a lot more to be found here than what you’d initially figure at a first glance. Made under the admirable mantra that the game has to be fun, easy to learn and full of depth, District 187 manages to take the dystopian setting and spin it into something that’s fun to play not for the background, but the actual gameplay and mechanics that permeate it. Intriguingly, there are no specific variances in characters, as instead the weapons themselves act as the game’s class system. What makes this dynamic all-the-more important is that each firearm can be extensively modded via decals, scopes, flash-lights and silencers to name but a few attachments, and these are all purchased via in-game currency that the players earn either through battle or rote memorisation of their credit card details. The modding system is quite extensive, and this depth is vital when learning the nuances of combat and attempting to work your way to the top of the leader-boards. Working together to hit the top of the charts is an all-important mechanic to victory in District 187, and the way it embraces the clan aspect of online gaming also gives rise to one of my favourite things about the upcoming shooter – persistence. Dubbed ‘Street Fight’, the meta-game in question ranks each clan and factions’ performances throughout each week and divides ownership of key sections of the District accordingly, which then provides additional boons to those who’ve made the turf their own. After tireless skirmishes in the slums, players will be rewarded with an even greater chance of unlocking more powerful melee weapons, while those who come up trumps in the financial sector will be granted a discount on the purchase of certain items, so it’s likely that some factions will choose to target a specific area for strategic gain, rather than contest every part of the district. Those who don’t want to worry about the constant turf wars, test a new weapon set-up, or ease themselves into District 187 can do so thanks to the addition of training servers, allowing players to battle without worrying about affecting their kill/death ratio. Systems will also be in place to make sure that players of similar skills are banded together, so that newcomers aren’t immediately sniped by those who’ve invested more time and to keep the field of play more unpredictable. District 187 will also boast ten different modes of play upon launch, and while I was only able to play the standard team death-match, I was informed of two other modes that will be available at launch. The first of these is the ‘Boss’ mode; both the SWAT teams and the Gangs will be trying to transport an important NPC across the map, aiming to both protect their VIP and assassinate the enemy’s, with the results potentially having a greater impact on who controls the region afterwards. 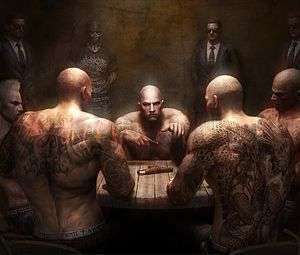 The other mode, dubbed ‘Bank Heist’, will see the Gangs attempting to pull one off while the SWAT team do what they can to prevent them, with the twist being that the side of justice can steal the money from the getaway vehicle and put it in one of their own, allowing the money to be given back to the security teams trying to regain order in the forsaken district. While it’s not the most unique MMOFPS around, I enjoyed what I played of District 187; it’s fast paced, plays well, and though it’s not graphically distinctive and the setting is cliché, there’s plenty of potential for depth in the gun-play, and the persistent world will mean that every battle has a consequence, rather than a meaningless array of fired bullets. While the full release is yet to be confirmed, the Beta hits the PC on the 18th of September. The fantasy setting is one that’s oft-explored in the realm of the MMO and, much like District 187 before it, Monarch initially seemed like it would be a typical dalliance and, like the aforementioned shooter, Heroes of a New Age completely subverted my expectations and left me excited in a big way. This is not your typical World of Warcraft wannabe, and after the gameplay I witnessed my immediate thoughts found themselves clinging to a Pikmin comparison more than they did the world of Azeroth, although even that comparison is disingenuous. In layman’s terms, Monarch is an MMORPG with RTS elements and, in practice, its scope is completely mental in one of the best ways possible. How so? Well, on top of your own playable avatar, Heroes of a New Age allows you to take control of up to twelve troops that can also be levelled up, customised and traded with friends. Though separate control of each troop isn’t possible, they’re all able to perform group commands that involve defending you, flanking your enemies or launching all out assaults, allowing you to make some more strategic choices in battle other than the “click thing until it dies” system other MMO titles employ. While twelve is the upper limit of troops you can command, it’s also possible to sacrifice numbers for power, with some of the more powerful minions demanding a smaller numbered squad in return. As with District 187, Monarch will involve a persistent world, but this is localised to a specific event rather than a week of all-out brawling. In each of Monarch’s major locations lies a castle, and whomever owns said structure after the weekly siege event will take control of the region. Once in command, the winning clan can dictate the prices and taxes levied on their land and putting them in a tough moral quandary – do they raise the cost of living and buying so that they can fill their pockets, or do they keep the prices low so opposing players are less willing to usurp them? Well-intentioned players could easily be corrupted when made aware that the castle’s owners have to pay to repair any damages sustained during the attacks, and there’s nothing stopping players from destroying it themselves if it looks like they’re going to be forced to relinquish ownership. Monarch’s scope is already impressive enough, thanks to your band of merry men and the aforementioned sieges, but to truly communicate it, we’re going to have to do some maths. Including your avatar and troops, that’s up to thirteen characters on-screen at any one time. 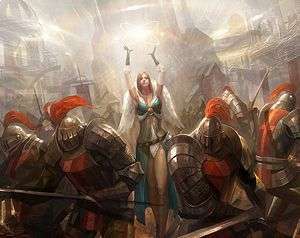 CJ Games Global are going to open the title up to beta when the castle siege PvP mode can successfully support two-hundred players on both sides. Each. That’s up to 2600 controllable characters in one single battle. Sound impossible? They’re already up to 150 players on each side. It’s probably best I move on to the final game before your mind implodes. In order to best explain CJ Games Global’s final offering, I’m going to have to throw a load of words at you with wild abandon: massively multiplayer online survival horror third person shooter role playing game. To some, that’s an incredibly specific and odd collection of words, but in this case, it’s also the upcoming Hounds. This MMOSHTPSRPG (try saying that five times in a row) won’t be hitting until 2014, but it already looks more polished than most other upcoming titles. Hounds may be by the same developers that are bringing us District 187, but both are incredibly disparate titles, despite their comparable settings. While District 187 takes place in a war-torn future as gangs fight for supremacy against the government SWAT teams, Hounds takes place in a future where a deadly virus has caused people to mutate into horrific creatures intent on wiping out the rest of humanity. Players take control of the Hounds in a series of story-based four-player co-operative missions based in real-world locales as they attempt to find and extract any survivors and potentially find a cure to prevent others from mutating. 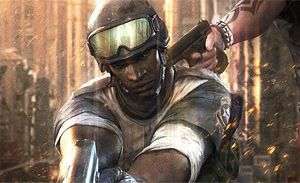 As the shooting takes place in a third-person environment, you’d expect some cover-based shooting, and you wouldn’t be wrong. However, there will be plenty of sections where there won’t be any cover at all, and so players will have to work together and keep their wits about them as they’re attacked on all sides. Additionally, one of the player’s weapon slots can be used to equip riot shields, allowing players to create their own cover whenever they want and provide some protection to another team-mate, who can hide behind their shield-holding ally for a brief respite from the enemy hordes. 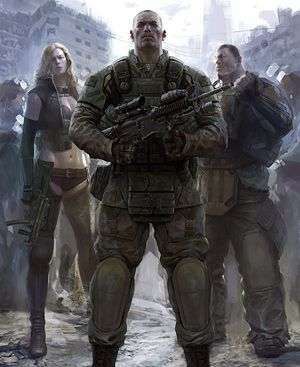 Where the role-playing aspect comes in is through the variety of weapons you’ll collect as you play through the story, with more guns becoming usable as you level up, though those trying to skip to later levels to pick up better weapons will find themselves getting wiped out by the increasingly powerful mutants. If your inventory is becoming cluttered by weapons you no longer have use for, then you can take them to the game’s equivalent of the auction house and sell them off to work towards some weapons you do want instead. Those wanting to buy their way to success may potentially find themselves out of luck, as high-level weapons will be locked off and unavailable to use until a level cap is reached, and some tools in your arsenal can’t be sold off at all, especially if they’re a primary-slot item. Hounds won’t just be a co-operative title, as the devs are also planning to put in a sixteen-player competitive mode, where players will be matched together based on their level so as to prevent one-sided conflicts. There’s an additional incentive for players to take on their peers; just as it’s possible to pick up new items in the story mode, there are a plethora of weapons that can only be accessed by fighting against other humans, rather than with them. Though these weren’t the only titles CJ Games Global have up their sleeve (they’re preparing to launch a mobile division next year, for example), these were the titles they felt most confident in showcasing, and it’s not hard to see why; each title either combines genres in a way previously unthought of by other developers to make something unlike anything you’ve ever seen, attempts epic battles on an epic scope, or even just breathes life into a tired formula by introducing a persistent gameplay mechanic as an incentive to keep players online and working together. If you hadn’t heard of CJ Games Global before, then now is a perfect time to stand up and take notice – they might just be the next big thing.